alaTest ha raccolto ed analizzato 69 recensioni su Philips QP2520/25 OneBlade Styler and Shaver, Lime. La media della valutazione per questo prodotto è 4.5/5, confrontata con la media della valutazione di 4.3/5 per altri prodotti. Abbiamo analizzato differenti valutazioni di esperti ed utenti, età del prodotto ed altri elementi. 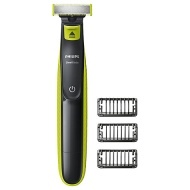 A confronto con altri prodotti, Philips QP2520/25 OneBlade Styler and Shaver, Lime ha ottenuto un alaScore™ complessivo di 89/100 = qualità Molto buono. Considering the cost of this product I expected better, second use the blade popped off and broke when replacing and considering the cost of replacement blades I'll probably not bother and look to returning the product. A simple yet effective product! For me it is simple, the Philips One Blade is the product that I have been waiting for to hit the markets for the last 25 years, all round perfection!! I am absolutely thrilled with my Phillips One Blade. Perfect for shaping the outline of my beard and for ploughing through the stubble when I want a shorter look. No nicks and no stubble rash. Extremely good, got one for my 91 year old grandad and he loved it so I got myself one, very happy. It's OK but not brilliant.